Remember the cavolo nero aka Tuscan kale I picked from the garden on Sunday, well I knew exactly what I wanted to make with it. 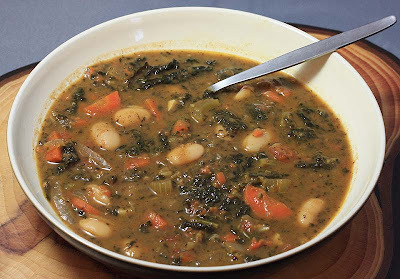 I have been hankering after this Zuppa di Castagne e Cavolo Nero, a deep dark chocolate looking soup that I saw on Barbara’s blog Dish'n' That a little while ago. I just didn’t have any nuggets of fresh chestnuts or even those cooked ones that are shrink wrapped, so I decided to substitute the fresh chestnuts with a tinned puree. But that wasn’t the only thing I changed, I adapted it a little more as I was cooking. I hope Barbara doesn’t mind. The soup certainly had texture and depth of flavour, and if I had not made it myself from scratch I would have been suspicious that a meat stock had been used, as it had a ‘meaty’ taste and smell to it. This flavour is imparted by the chestnuts. The soup itself was rather delicious and certainly a meal in a bowl, and as Barbara suggested I served it with a hunk of good crusty bread. I am submitting this recipe to Grow your own (GYO), which celebrated it second birthday. It was started by Andrea Meyer of Andrea's Recipes. 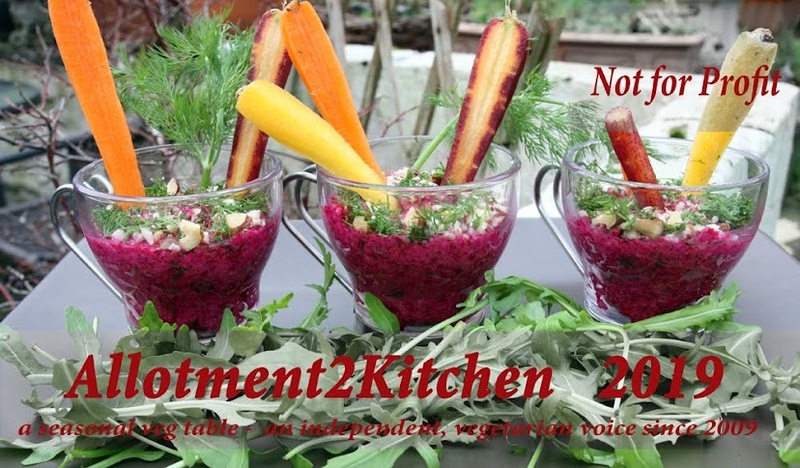 It is a twice-a-month blogging event that celebrates the foods we grow ourselves and the dishes we create using our homegrown products. GYO#40 is presently being hosted by Nate at House of Annie and he's invited us all to do it again. How can I resist such an offer, especially to show off the last of my homegrown black kale. Heat the olive oil in a large soup pot and add the onion and garlic. Let sweat a bit, then add the carrot and celery. 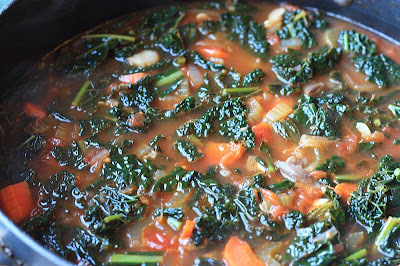 Saute for a few minutes, then add tinned tomatoes, the chopped kale, Tamari and seasoning and cook for a few minutes more before adding the vegetable stock. Let it simmer for about 30 minutes stirring occasionally, before adding in the pureed chestnuts and beans and simmer for a further 15 minutes. Transfer about ½ pint of the soup to a blender and process. Return to the pot; give it a stir. Add more seasoning if required and let simmer for a few minutes before serving. Sounds really good - would never have thought of using chestnut puree in soup. I expect the Tamari helped with that umami flavour. Wonderful soup, Mango. I'm glad you made the recipe, and made it your own, to boot! I'm sure the tinned chestnuts worked just fine. And don't you just love that Cavolo Nero? You're lucky to still have some that wintered over in your garden. I can't wait to plant a new crop when things warm up and dry out a bit, here in the Northeast. Check back Friday for another recipe using kale that is akin to healthful "junk" food. Looks easy and very good! Mmn, yum. I've still got a bit of cavallo nero left on my allotment so this sounds a lovely way to finish it up. 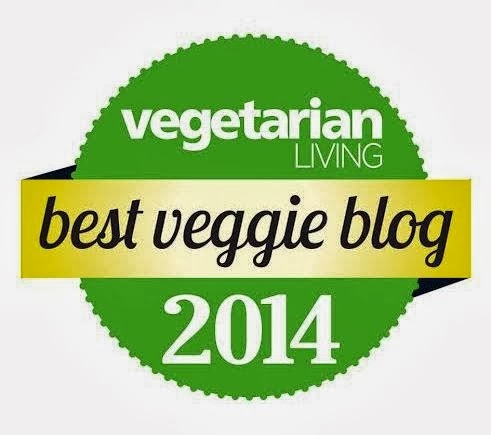 Thanks for leaving a comment on my blog, it means I've discovered all your lovely recipes. That looks so darn tasty I wish I was by you to get my bowlful. what a great soup..I love all the flavors.. I love the look of that soup and the name is so intriguing. Wonderful. This looks like a great way to use Cavolo Nero. It certainly does look like a 'meaty' soup. What a tasty & fab looking soup aka meal!! WOW..you're already picking from your garden! I am so jealous, our is still covered in snow although it's rapidly melting! Wonderful soup and perfect for Spring! Hi! I linked over here from Half Pint Pixie's blog and have been enjoying reading about all your growing and cooking. We have an allotment in Dunblane and DH grows the Italian kale, so I'll be taking a note of this recipe. It looks SO GOOD! The first time I had chestnut puree in soup was when I made of Nigella's soup recipes 'lentil and chestnut'. It was really simple, but really delicious. I think the 'umami' flavour came from both the tamari and chestnutsbut maybe even the meaty texture of the cavolo nero, afterall it ain't called 'dinosaur kale' for nothing :D Hope you have a good weekend. Thank you so, so much Barbara for sharing the recipe in the first place and inspiring me to make it too. I am sure there will be plenty of others coming from your kitchen. I am looking forward to growing more of this kale, its the one veg that wasn't decimated in the garden by the beasties. Thank you so much for coming by Nicky. Thank you. I hope you recover from you cold, not a nice way to be, especially with the weekend here! Thanks Jo. It really is a deep flavoured soup. Thank you so much Sophie. It certainly was a meal in a bowl. The sun is starting to shine here and the gound is beginning to soften, but I am still nervous, its cold and could still snow. At least I can start thinking about planting some seeds. I hope the snow melts away for you so that you can start playing in natures garden! Thank you so much for coming over. I am so pleased that you are enjoying reading about my your growing and cooking. I don't think i've ever been to Dunblane. I must visit it someday. 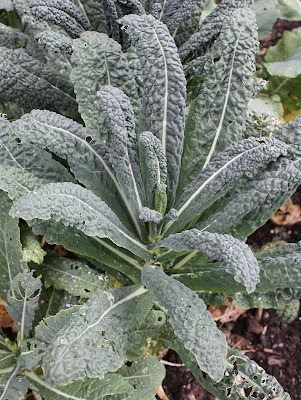 I have a number of Italian kale recipes on the blog, so please do take a look at them, some you may like, others perhaps not. But its worth checking them out. Once again, thank you so much for coming by. What a magnificent meal! That soup looks so hearty and comforting that I want a bowl right now. 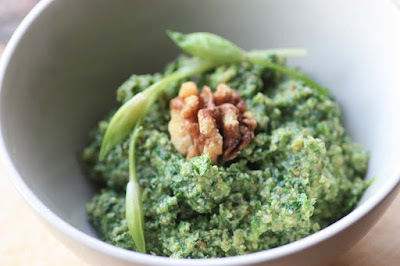 I'm not sure of where to source kale from in Perth so I am thinking I will try this with silverbeet instead. What do you think? Thank you so much Hannah. It relaly was a hearty dish and delicious too. Its a shame that you not able to source kale: any kale would do. I would personally recommend a cabbage in place of the silver beet which we call chard here, as I think it will produce a different dish. I also think cabbages are more substantial, whereas silver beet/chard are lighter in comparison. But if you so go ahead, please let me know how you get on. Warm wishes.